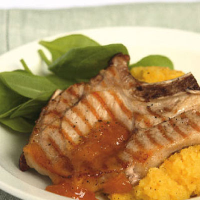 Without the fatty rind, pork chops can be cooked quickly, and with the addition of curry spices and mango chutney, swede becomes something really special, making this a swift, substantial supper. Serve it with some baby spinach. Heat a ridged griddle pan until hot. Brush the pork chops with the olive oil and season. Cook the swede in simmering, salted water for 20 minutes or until soft. Cook the chops for 4–5 minutes on each side, until cooked through. Keep warm. Drain the swede well and return it to the pan with the butter and spices. Mash firmly until smooth, then beat in the milk, salt and plenty of black pepper. Serve one chop per person with the mashed swede and baby spinach, and top the meat with mango chutney. The Corker recommends - Keep excitement levels high with a deep, dark and voluptuous Chilean Carmenère, easily capable of standing up to the intriguing flavours of curry-spiced swede.